The avatar was removed by the creator to "fix" the issues with undies (there were none) and will in theory return to the store. A few folks got the original version and "I" at least am wondering if that will be removed from their inventory. Seems likely. Hopefully we will get a report (I asked for one). LOL. That is an optimistic viewpoint. Happy to see it!!! The avatar was removed by the creator to "fix" the issues with undies (there were none) and will in th﻿eory return to the store. A few folks got the original version and "I" at least am wondering if that will be removed from their inventory. Seems likely. Hopefully we ﻿will get a report (I asked for one). I grabbed the original and created avatar #4 for that reason! To see if she is removed. I'll let you know if she dissapears. When the creator adds underwear, I am sort of hoping they can remove the dress. Yep! It really is Sad thing is, this is the sort of "lady" I swing the banhammer at most at my club. It's really quite a popular thing in SL. Newer reviews tend to be of the form "tried it, hit technical problem early, gave up". This is out of over 4,000,000 Steam users on line. The all time peak was the first day. Since then, each day's peak is lower. Zero news coverage. This is pathetic. Sansar should have a few thousand users by now. It's free, after all. Could be worse. 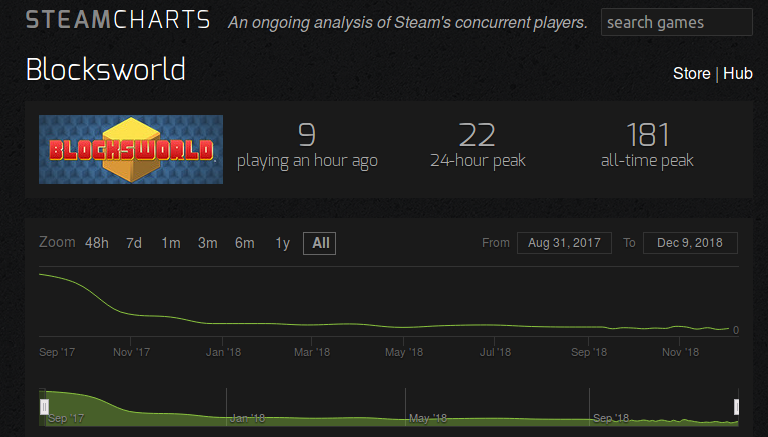 Check out the stats for Blocksworld, LL's other product on Steam. Blocksworld statistics. Blocksworld is Linden Lab's answer to Minecraft. Not as successful. Sansar should have a few thousand users by now. It's free, after all. As are most other "Virtual worlds". Welcome to the harsh worlds of hard business reality. I thought about that when Drax gave a whole radio hour* to the SL-to-Sansar migration of the "Lux" historical recreation. Supposedly it wasn't ever intended to stay on SL, the SL installation always only a temporary prototype for the advanced technology to be had on Sansar, but it was also clear that the plan had always been to migrate somewhere that land costs nothing, so all the operating costs could be pocketed by the creators rather than the platform provider. Smart. And reminiscent of the vast migration from SL to OpenSim by educational institutions when they lost their big subsidies for several dark years. And so I'm thinking it's OpenSim, not SL, that's really Sansar's proper competitor. Or would be, hardware permitting? Anyway, I sure wouldn't want to be in the OpenSim business now. * The episode title is "OLD LUX SL IS DEAD. 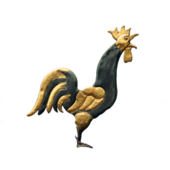 LONG LIVE NEW SANSAR LUX" -- just in case anybody took seriously Draxtor's claim of even-handed support of Second Life. I think he's subsidized by the Lab, right? If so, the invisible hand also has a thumb on the scale. Steam currently allows Adult Content - those thinking such is a problem, try to keep up. Steam has categories other than "Games" though the way they have them all arranged is rather idiotic. Under their current system, Sansar belongs under Software. As would Second Life if Linden Lab ever tried to list it. Point blank: Virtual Reality needs its own primary category - as it stands it is presently and erroneously placed under Games. Early Access needs to be its own category as well, with several sub categories. Also point blank: As stated above, if you really think listing things containing Adult Content on Steam, is a problem ... you really haven't been paying attention. 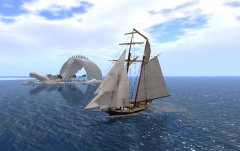 Well Opensim has always been a "competitor" but since much of what can be done in SL cannot be done in OS it only fits in with a few business models. And then there is the theft part of the platform. Not enough devs working on it and those that do don't agree. So very fractured. Very good for folks that simply want to plan and visit though. How low can it go? Years of effort, dozens of staff, millions of dollars in investment, and the level of usage shown above. 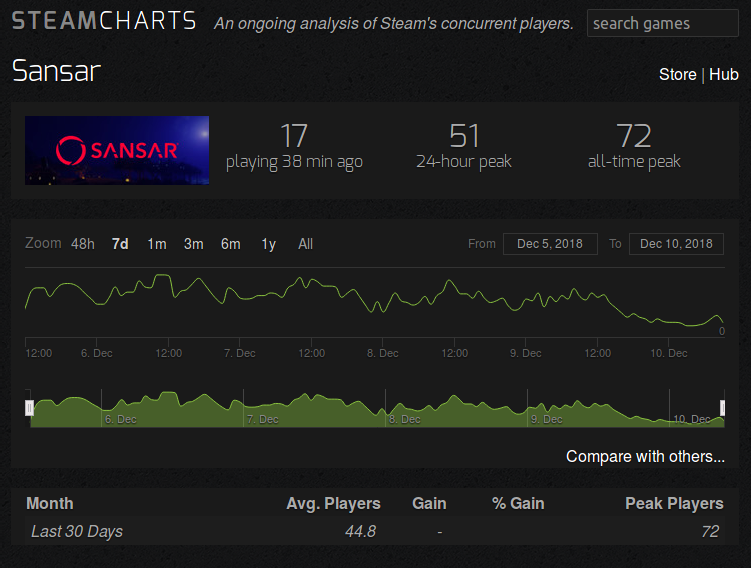 I didn't expect Sansar to be a huge success, but I thought it would reach VRchat levels of usage. VRchat has a steady 5000 or so concurrent users, down from 10,000 shortly after launch. Sansar is at least a better VRchat. Yeah, I didn't think Sansar would be a thing when VRChat exists. Most likely, but it would need Ebbe to eat a lot of Humble pie. Meanwhile. Thank the gods we have Grumpity and Patch to care about us. Well, sometimes you have to fail big with a vision, ...maybe it wasn't all futile. Who knows, maybe animesh is a byproduct of Sansar. I menat to sned that in IM and removed my post. hihihihi.... I will still leave patch a plate of cheese for xmas! Hang on, there are Patch Glytches? Patchoulies - if you come online I can hand you commons and rares, sadly epics are no-trans. Oh you are so sweet but.. the fun for a kitten is in the patch-oulli hunt. This is a good trigger to make me try that game.